HAPPY ANONYMOUS? No worries -- this location should be pretty easy to get. And once you ID the movie (correctly, no doubt), let's talk about it! American Beauty? Maybe not. This looks really familiar though. Father of The Bride, the Steve Martin version. Yes. It's in Pasadena, on S El Molino Ave.
That is clearly almost the house from "Who's the Boss?" The correct answer being "Doug". Points? It's weird how the first three guesses on here were the movies I was thinking about too. I can't even explain why, just some sort of visual association. I'm gonna go with Father of the Bride. Ay oh, oh ay - what about my guess, Andy? It looks alot like Nancy's house from A Nightmare on Elm Street. But it's not. I call it "Where the F is Doug: The ADD Edition"
I thought that as well. But as a European, all American houses look exactly the same to me. One week you should take a picture in front of a house that wasn't featured in any movie and just watch us come up with entertaining guesses. I was thinking Mr& Mrs Smith house. Is it warm in the winter and cool in the summer? Is it a great house that Steve Martin never wants to leave? Gosh I love Father of the Bride. I know it has problems but it really makes me feel so happy. I love that I'm in your head, Doug. By the way, you're at 843 S. El Morino Avenue. WE. ARE. ANONYMOUS. Sorry this is late (I was on VACATION). SO MANY OF YOU ARE RIGHT (including Joseph Finn, Kevinflynn, Andy Bishop, Kersey Resch, Daniel Epler, and motherfucking ANONYMOUS [<-- this guy]). 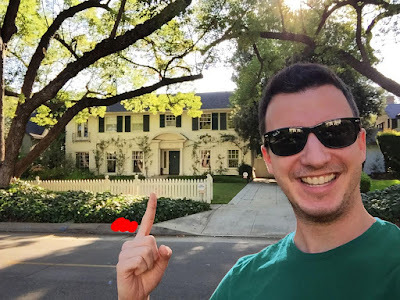 This is the Banks family house in Father of the Bride (1991), located on South El Molino Avenue in Pasadena, CA (not neighboring San Marino, as described by George Banks [Steve Martin]).